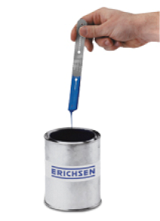 A simple reliable instrument for checking the required brushing or spraying consistency of coating materials. Invaluable for users of paint. Serves also as stirrer for thinning down small quantities.